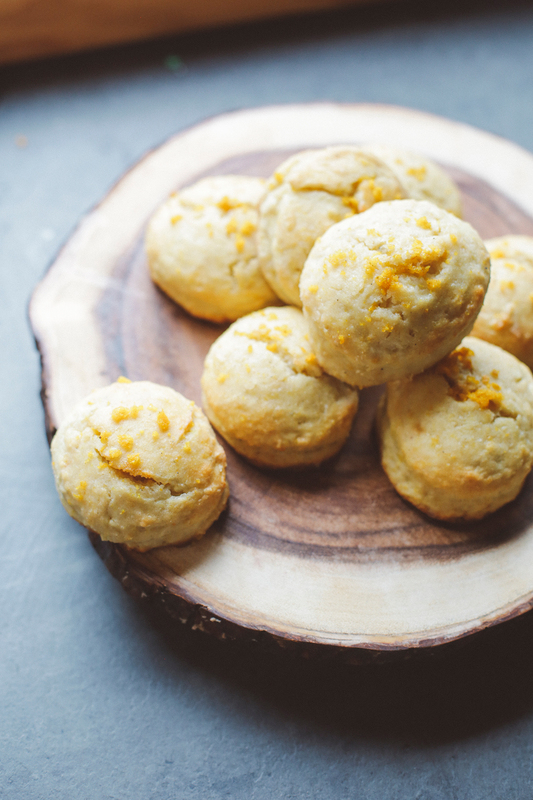 Orange Cardamom Scones. They are as delicious as they sound! Getting there was an adventure in spicy discovery. If you’ve ever wondered how to utilize delicious cardamom in a baked good, get that mortar and pestle out and read on! Does anyone else have trouble writing down recipes? For me, it’s a lot of adding something, tasting, adding something else and tasting again until it’s just right. My dad rarely used a cookbook. It was a whole lot of adding spices, taste testing and throwing it in the oven; I guess I get it from him. I need to get better at writing it all down in a journal as I go. I’m really envious of those who can keep up with one of those darling recipe boxes. I dream of starting one for a nice keepsake should I ever have kids. But my hands are covered in gooey batter, my pen is always missing, and when I look for a journal to write things down in, it’s always hidden away on a shelf. In short, I need to be more organized. 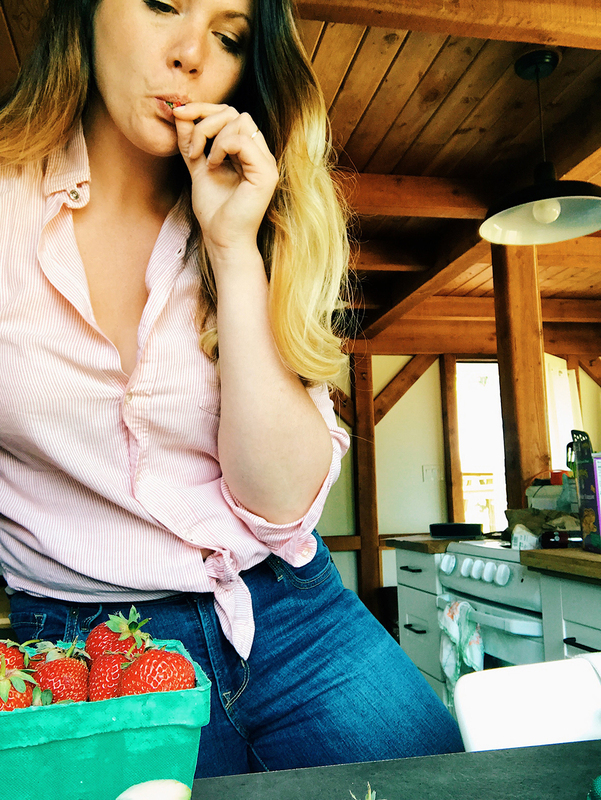 For now, I’ll continue analyzing what I did, remembering how many tablespoons of cardamom I put in, and trying to put it all into words for you to write down. We had a breakfast birthday celebration at work last week, and what better excuse to make scones than a breakfast party? I have a favorite Lavender Earl Grey recipe that I’ve made a ton of times, and it always gets loads of compliments. But in an effort to branch out and experiment, I thought I should try something new. Out of the blue, my boyfriend Ben suggested I try orange and cardamom. In the past few years, I have developed a serious love for cardamom. 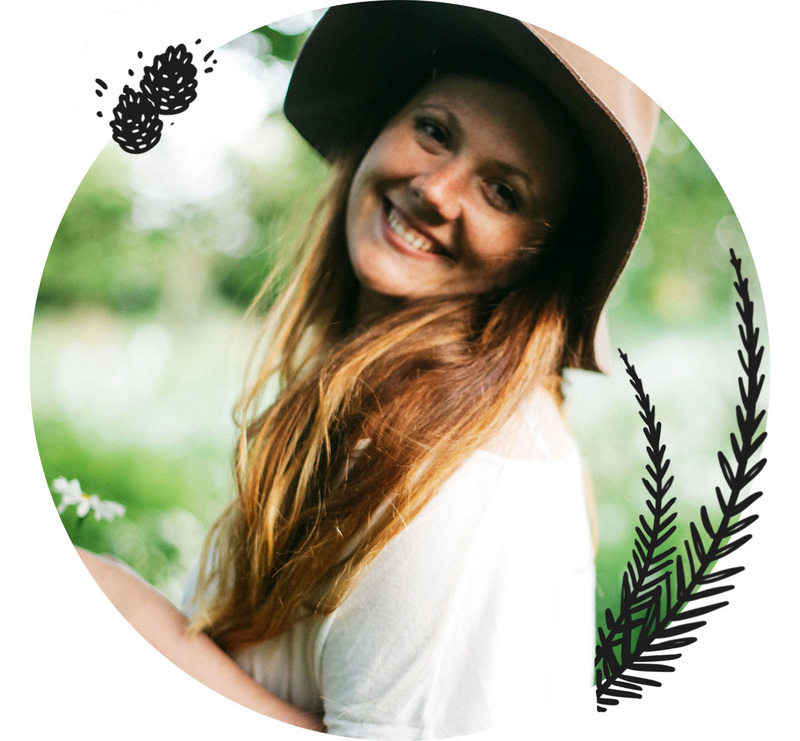 I’ve had it in ice cream, amazing indian recipes and even a new face cleanser I bought from a local Vashon shop. It has a fresh but spicy smell that I just love. So, cardamom mixed with orange zest sounded like a really great food adventure that I wanted to try. As much as I love it, I had never worked with it in its original form. It comes in hard little pods. If green, these pods need to be browned in a pan for a few minutes to get hard and crisp. Then, you open them up and delicious pellets of cardamom await. I wasn’t sure if I should use previously ground cardamom, or break open the pods and do it myself. After a bit of research, I found that grinding up fresh cardamom will release more oils from the spice, making it much more effective in a recipe such as this. So, if you’re going to be using cardamom while baking, break out your mortar and pestle and grind those little kernels up. In my case, I wanted to blend the cardamom oils with orange zest. So, I finely grated the zest of one orange and scooped in a small handful of cardamom. Here’s where that, “Uhhhh… how much did I use?” comes into play. When you’re grinding the cardamom up, it will be pretty fragrant. I was afraid that it would overpower the orange, so I added more zest. In hindsight, I should have left the extra zest out, as it was the cardamom that was overpowered. To really infuse some flavor, you’re going to head to the tea aisle. 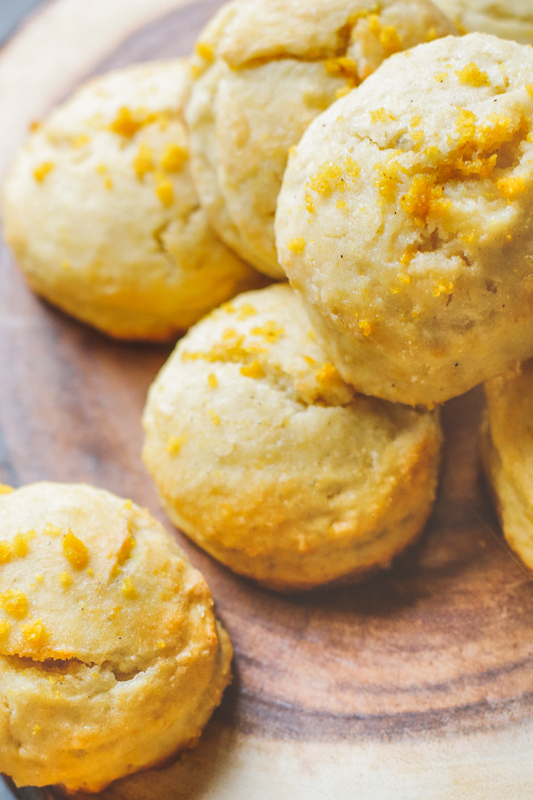 Find a flavor that you love; for this recipe, you want something orange. 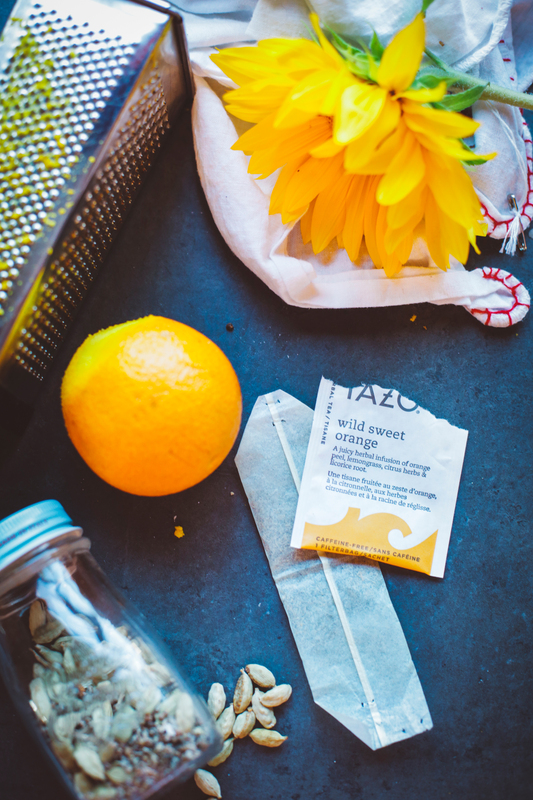 I landed on a Wild Sweet Orange tea from Tazo. It smelled the best in the box (yes, I am one of those people) and was totally affordable. Steep your tea bag in a 1/4 cup of boiling water for three minutes. I like to taste the tea to see if it needs anything else. Like I said above, I wish mine had had more cardamom flavor, so take that into consideration when you are blending your tea and spices. Open up one more tea bag, and empty it into a bowl. Scoop up a teaspoon of your ground orange and cardamom and mix it into your tea leaves. You’ll use this in your dry ingredients. In a large bowl, combine flour, sugar, baking soda, baking powder, salt and spice/tea mixture. For extra texture, beauty and flavor, I added the zest of an entire orange, using the second finest side of the grater. I found that the finest side made the zest into more of a paste when stirred together. Take your cold butter (seriously, make sure it’s cold – not room temperature). Cut it into thick slices, and then cut those into cubes; add to your your dry mixture. 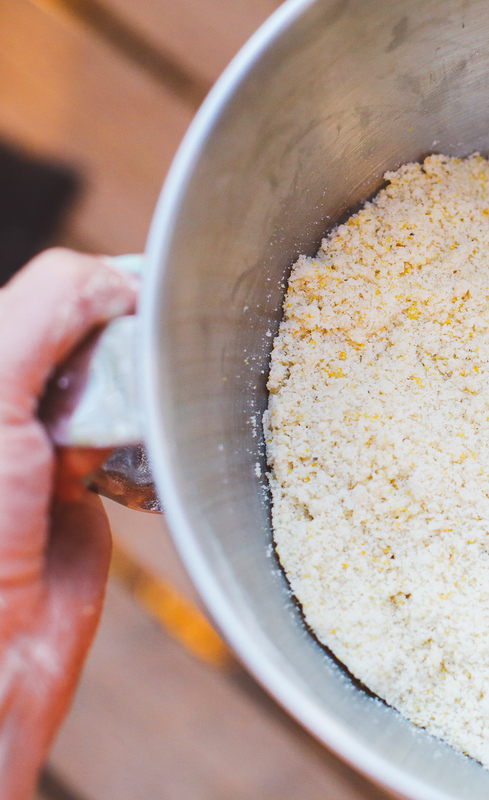 Using your hands, rub the cold butter into the flour until it becomes almost like sand. Make a well in the center and add the buttermilk, vanilla extract and 1 tablespoon of your brewed orange cardamom tea. Using a wooden spoon or silicone spatula, gently stir the mixture together. I tried using my hands, but that led to the gooey fingers that won’t allow me to write in a recipe book. Soo… use a spoon. Make sure that you blend this together very gently. Handling the mixture as little as possible is what will give you the beautiful scone texture. Do not knead! You’ll probably get three or four scones out of your first square. Once you’ve used up all your doughy real estate, gently gather all of the dough, still handling it as little as possible, and pat it into a square again. 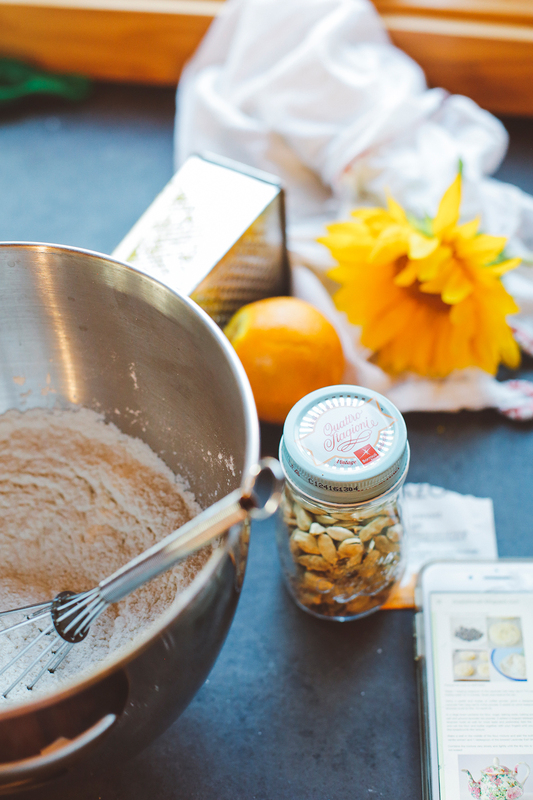 Repeat this until you’ve made all the sweet little scones you can. Place your scones on a baking sheet lined with parchment paper, and brush the top of each scone with heavy cream, followed by a sprinkle of sugar. My oven, like most, is temperamental and doesn’t always bake evenly. I’ve learned that bottoms get easily burned and sometimes I have to let the door open to let wafts of smoke out. For these scones, I’ve learned to put a second cookie sheet under the first, to ensure the bottoms remain perfectly brown. Nobody likes a “soggy bottom,” but nobody liked a burned bottom either. Bake until the edges just begin to brown. While my scones were baking, I decided to add even more flavor with an orange cardamom glaze. In a small saucepan, heat up your milk and a scoop of the cardamom orange spice mixture. Yes, the milk is going to be full of floating zest and ground up cardamom, but that’s okay. Remove from heat and steep with two bags of your orange tea for about 7 minutes. Using a small sieve or cheesecloth, strain the mixture and discard the leftover cardamom and orange. Measure out a 1/4 cup of the mixture and whisk together with the powdered sugar. Depending on how thick you like your glaze, add more or less sugar. I like mine to have a pretty runny consistency so that it pours over the scones nicely. Once the scones are baked, let them cool for five minutes before transferring to a cooling rack. After they’ve cooled considerably, place a plate under the rack, and cover the scones in the glaze. A lot of the glaze will fall onto the plate, which you can then scoop back into the bowl. I like to cover mine twice. It’s really not too sweet. However, if your glaze is really thick, you may just want to do it once. For a nice garnish, I grated some orange zest and sprinkled it on top, in between the layers of glaze. 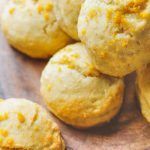 A spicy cardamom infused take on a brunch classic, these orange and cardamom scones are sure to please your palate and that of your breakfast loving friends. 1.) Preheat the oven to 425F. 2.) 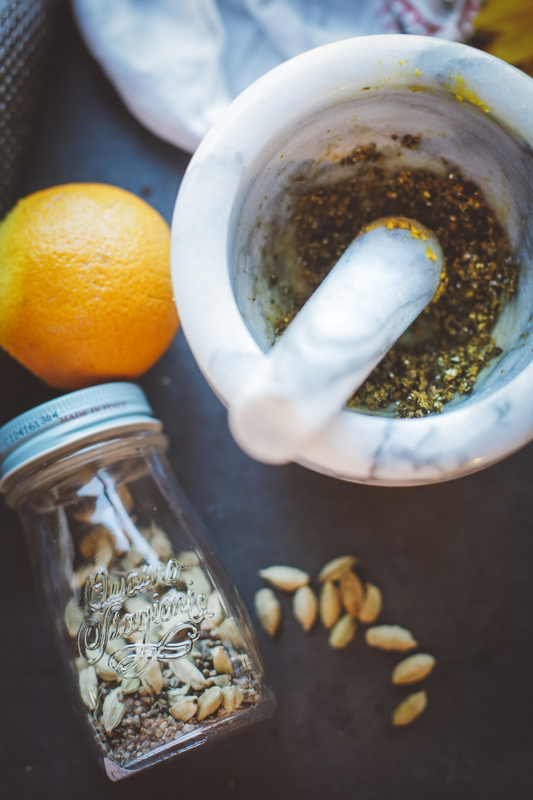 Grind orange zest and cardamom with a mortar and pestle. Gently open one bag of orange tea and combine with one teaspoon of the orange cardamom mixture. Fold bag back together and steep in 1/4 cup of boiling water for three minutes. 3.) In a large bowl combine the flour, sugar, baking soda, baking powder, salt, one teaspoon of ground orange cardamom powder and the zest of one orange. 4.) Add the butter to the flour mixture and rub together with your fingers until you get a fine, sand-like mixture. 5.) Make a well in the middle of the flour mixture and add the buttermilk, vanilla extract and 1 tablespoon of the brewed orange cardamom tea. 6.) Combine the mixture very slowly and lightly until the dry mix is wet- do not knead! 7.) 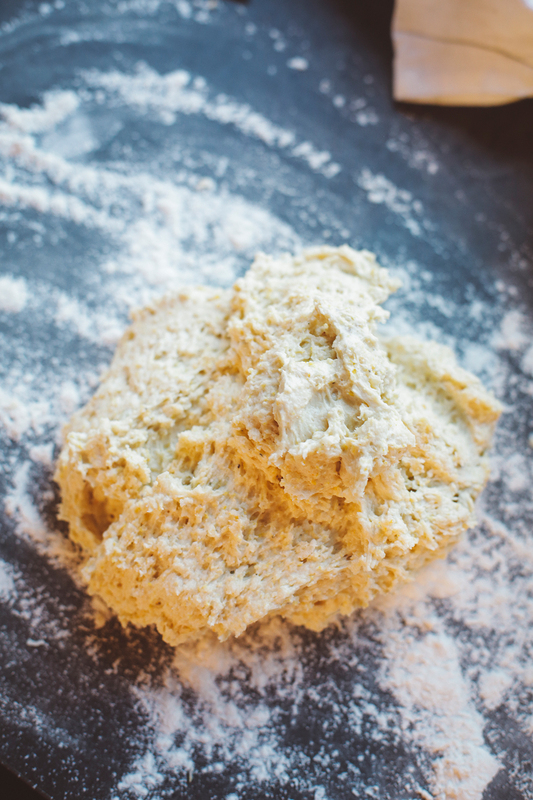 Turn the mixture onto a well-floured counter and with floured hands, gently pat the mixture into a square or rectangle that is 1 1/2 inches thick. Using a cookie cutter, cut the scones into circles or wedges and lay onto a baking sheet covered in parchment paper. 8.) Brush the top of each scone with heavy cream and sprinkle with sugar. 9.) Bake for 10 to 12 minutes, or until very lightly browned. 10.) Let cool on tray for 5 minutes before transferring to a cooling rack. 1.) 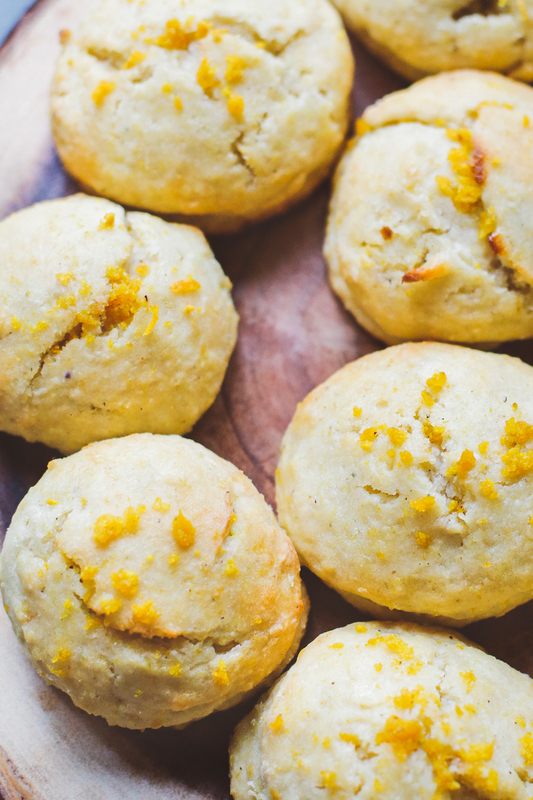 While the scones are baking, bring the milk and cardamom orange mixture to a simmer. Remove from heat and steep two orange tea bags for 7 minutes. 2.) Strain the mixture using a small sieve, and discard the remaining orange and cardamom. Measure 1/4 cup of the steeped milk. Pour into a small bowl and whisk together with powdered sugar. For a thicker glaze, add more sugar. 3.) Once scones are cooled, place a plate under the cooling rack to catch excess glaze. Spoon glaze over the top of each scone. 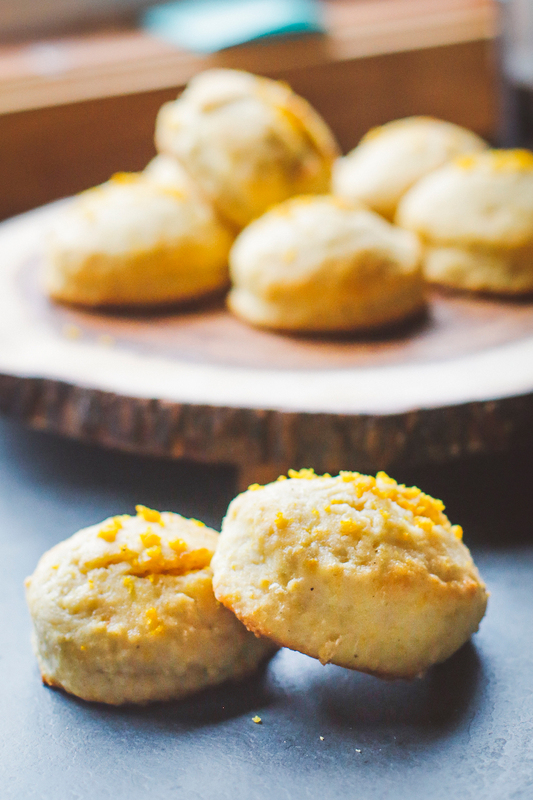 Grate some orange zest and sprinkle over each scone as a garnish. 4.) Seal in the orange zest with another layer of glaze. Let glaze set before stacking or storing. *You will most likely be left with an excess of orange cardamom mixture. Save this for future teas or discard. **If your glaze is on the thick side, consider covering scones in just one layer.